'Blood Brothers' is the story of fraternal twins separated at birth. Their different upbringings take them to opposite ends of the social spectrum, one becoming a councillor and the other unemployed and in prison. When they both fall in love with the same girl, it causes a tear in their friendship and to their tragic deaths, but is is questioned whether class was more to blame than superstition. Fay Grummitt, Lily Jones, Ben Livingstone, Connor Goddard. For more images of the production, please click here. 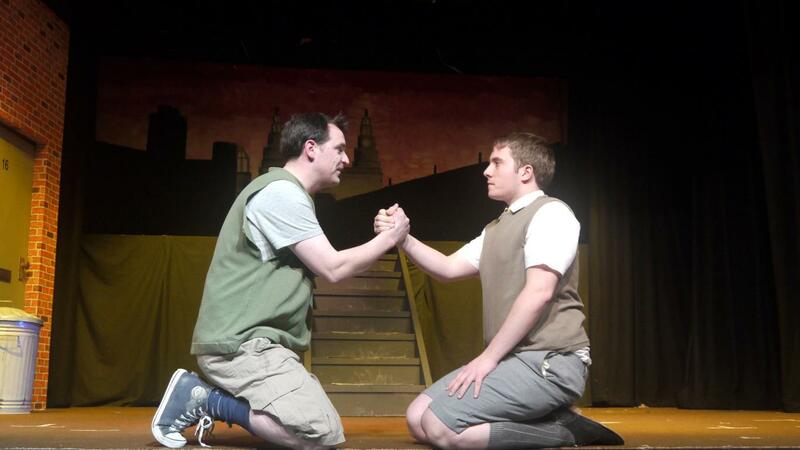 The Blood Brothers musical has been running in the West End and around the country for so many years now, it is easy to forget that it actually started life as a play by Willy Russell. So it is interesting to see the original being performed once again by Blackwood Little Theatre - after they first tackled it in 2006 - and a superb cast taking on the wide range of roles. Naturally there are many differences - it would be impossible to include all the many characters that appear in the musical - and the original ending is much more tragic, and rings much truer, than the finale in the musical. 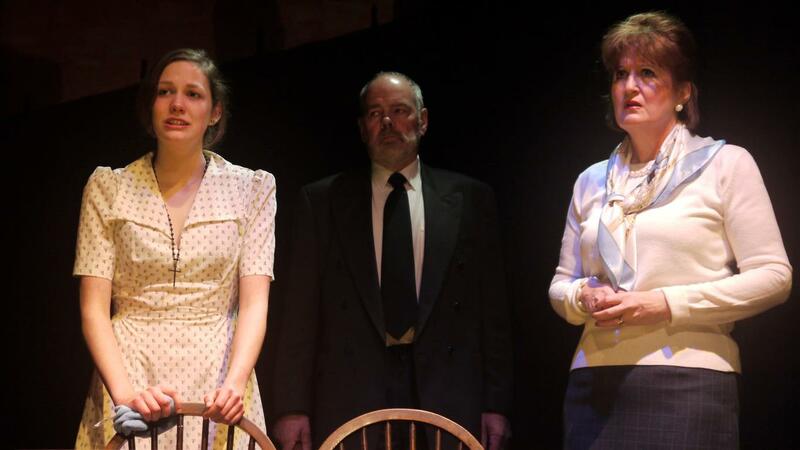 Young drama student Anna Barker excels as the worn-down mother, the iconic Mrs Johnston with her many offspring, and her Liverpudlian accent is spot on. But Mark Thomas and Matthew Oliver playing her youngest children, the fated twins Mickey and Edward who are separated at birth, really steal the show. dramatically as the play heads to its inevitable and tragic conclusion. Yve Price is inspired as Mrs Lyons, the wealthy woman so desperate to have a child that she persusaded Mrs Johnston to give her one of the twins - so beginning the chain of events that leads to both the twins' fate. And Graham J. Evans as the narrator is a constant menacing presence, always observing and commenting darkly on the characters' behaviour as the play progresses. It is a play filled with superstition and intrigue and it is a tribute to both director and actors that you remain spellbound to the last scene.